Today is a day of hope for immigration reform. More than 500 immigration activists and faith leaders have gathered in Washington, D.C. to call on Congress to act on immigration reform. They represent the tens of thousands of you reading SojoMail today who, over the past few years, have taken action on immigration reform. It has been a long road, and a tough fight. But your actions make a difference. Due, in part, to this ongoing pressure, Senator Harry Reid announced yesterday that the DREAM Act will be voted on as early as next week. The DREAM Act is bi-partisan legislation that allows young people who have been raised in the United States, excelled in school, and then pursued higher education or service in the military to have a pathway to citizenship. For people of faith there is a moral responsibility to hope. That's always our job, even when the political winds are against us. Those of us who build our lives on hope have a calling, and a vocation, to spread that hope because, when we do prevail in the cause of justice, it is always hope which has kept our hearts alive until victory finally comes. Today is not just about the current political realities of comprehensive immigration reform; it is about being evangelists for hope -- it is about putting our faith into action. Our faith is always personal, but never private. Today is about personal faith and public action. We are here today because there is no such thing as an illegal human being. We are all, first, children of God, endowed with the image of our creator and deserving of respect. In the first two chapters of the Bible, we learn that it is in God's image that we are created, and in the first two paragraphs of the Declaration of Independence, we hear that equality does not come from government but from God. It does not find its source in any law or constitution, it does not come from the color of your skin or the land in which you were born, but from the truth that should be self-evident -- that all men and women are created equal; that they are endowed by their creator with certain inalienable rights; that among these are life, liberty, and the pursuit of happiness. We believe in the rule of law, but we also understand that it is these things that are the purpose of the law. When the law no longer fulfills this purpose, it is unjust and must be reformed. Any good public policy must be based upon respect for your fellow human beings as children of God. It must be based upon respect for family and community. But today, we recognize and remember that every day 1,100 people are being deported -- 1,100 people. For us, 1,100 is not a statistic, a talking point, or just another campaign issue. This number represents our parishioners, our neighbors, our brothers and sisters, our family and friends. It represents families that are torn apart, lives that are disrupted, and dreams that are shattered. It breaks our hearts to know that somewhere there is a 7-year-old crying for her dad, who was deported, to come home. I know this girl's tears break the heart of God, and they should break the hearts of our lawmakers and give them the motivation to fight for respect, relief from cruel deportation policies, and meaningful reform. 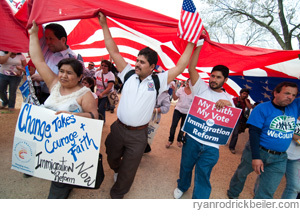 It has been a long, hard road in fighting for immigration reform. The people here today know that better than anyone else. Hebrews 11 says faith is the substance of things hoped for, the evidence of things not seen. My best paraphrase of that verse is that hope is believing in spite of the evidence, and then watching the evidence change. Brothers and sisters, faith leaders and immigrant rights activists are here because of our faith, and we will continue to act in hope until the evidence changes. The politicians, the media, and the pundits say, "Not yet. Just be patient. Wait for the political climate to change, or for this election to pass. It's the other party's fault. If everyone just votes for me and my party all these problems will be solved." I am sure that abolitionists heard this, labor leaders, and civil rights leaders were told this time and time again. It may be the job of politicians to have these considerations and make these pronouncements, but it is our job to keep on fighting anyway. We ignore the excuses because we know that it does not have to be this way. We ignore them because we are not here to follow the political winds, but we are here to change them. We ignore them, and we're not going away just because this is hard. Our hope will outlast their political cynicism and maneuvering. We ignore them because we are people of hope who believe in spite of the evidence and then watch the evidence change. Jim Wallis is the author of Rediscovering Values: On Wall Street, Main Street, and Your Street -- A Moral Compass for the New Economy, and CEO of Sojourners. He blogs at www.godspolitics.com.